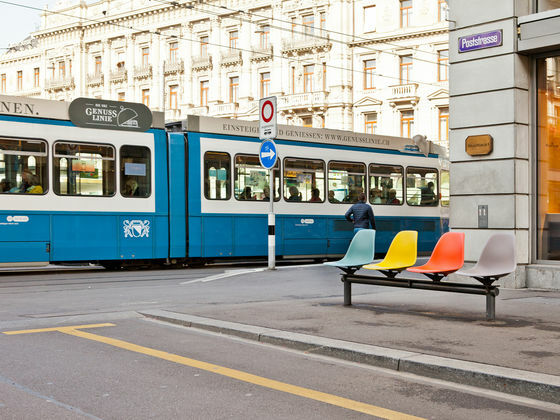 In autumn 2017 Vitra is opening two pop-up stores in the cities of Zurich and Amsterdam. 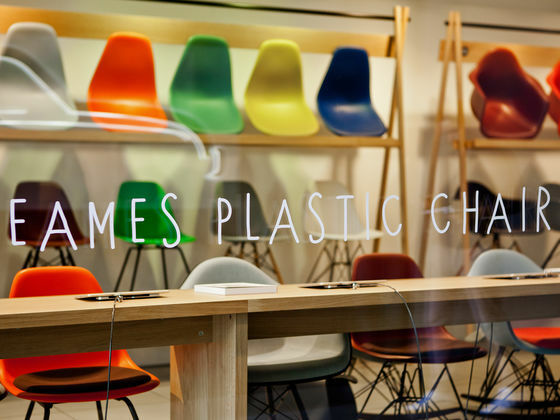 The temporary shops are dedicated to the Eames Plastic Chair by Charles and Ray Eames. Over a period of three months, visitors to the Vitra Pop-Up Stores are invited to explore the wide array of bases, shell colours and upholstery versions available for the Eames Plastic Chair. Freely combining the various options, they can then order their own personal model. 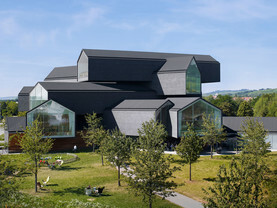 In the pop-up stores, Vitra augments the stationary shopping experience with digital components and gives customers the added-value benefit of both channels: physical displays offer inspiration while digital ordering provides access to more than 100,000 product configuration options. Orders are subsequently delivered to the customer’s home address – for a large number of models within 48 hours. Monday – Friday: 10 a.m. – 7 p.m.
Tuesday, Wednesday, Thursday, Friday, Saturday: 10 a.m. – 6 p.m.
Sunday: 12 p.m. – 6 p.m. Here is a summary of information and answers to frequently asked questions about the Vitra Pop-Up Stores in Zurich and Amsterdam. What can I buy in the pop-up store? 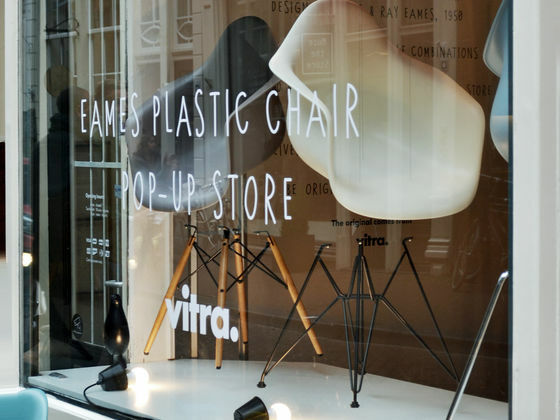 The Vitra pop-up stores in Zurich and Amsterdam are dedicated to the Eames Plastic Chair by Charles and Ray Eames. Over a period of three months, you can explore the wide array of bases, shell colours and upholstery versions available for this classic piece of furniture. The various components can be freely combined to find your favourite individual model, which you can then order right in the shop. 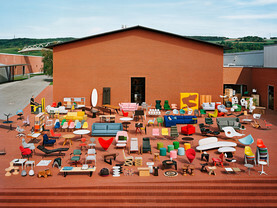 In the Zurich store, we are also offering a selection of products from the Vitra Accessories Collection. 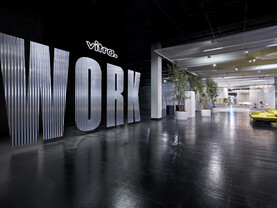 Can I purchase other Vitra products in the pop-up store besides the Eames Plastic Chairs? A selection of accessories is offered in the Zurich store. 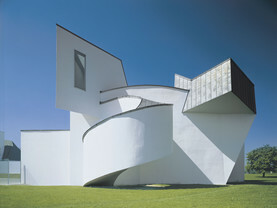 If you are interested in other products from the Vitra portfolio, you can search for nearby dealers here. 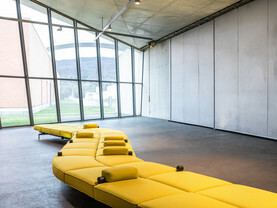 In Switzerland, the Netherlands, Germany, France, Austria and Belgium, you can also order all of our products from our online shop at vitra.com. Can products bought in the pop-up store be taken home right away? 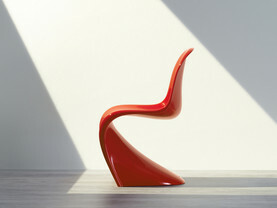 Your Eames Plastic Chair will be conveniently delivered to your home address within a short time after ordering. The accessories are directly available in the Zurich pop-up store and can be taken with you upon purchase. What is the delivery time for the Plastic Chairs? 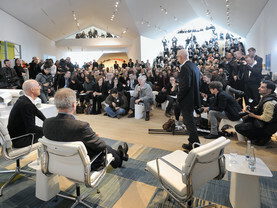 ver 1000 different configurations of the Eames Plastic Chair can be delivered to your home within 72 hours of ordering. The expected delivery time for all models with a seat cushion, as well as PSCC, PACC, DSS and DSS-N, is 2-3 weeks. All other models are precisely manufactured to order within a period of 3-4 weeks and subsequently dispatched to your home address. What is the cost of delivery for purchases from the pop-up store? Which parcel services are used for delivery? We ship orders with DHL. Larger packages (two or more side chairs) are shipped with GoExpress. Is it possible to track the status of my delivery? For GoExpress deliveries, a service representative will contact you by telephone to arrange a delivery time. If your order is shipped with DHL, we will send you a tracking link that allows you to follow the status of your delivery. 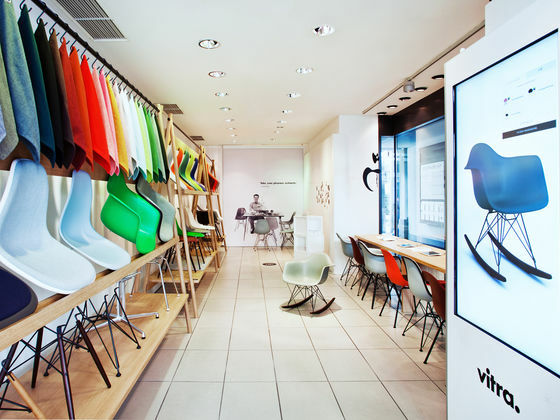 If I do not live in Switzerland or the Netherlands, can I still purchase an Eames Plastic Chair in a Vitra pop-up store? 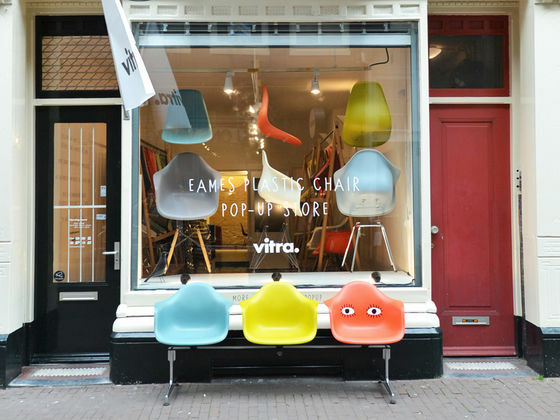 Eames Plastic Chairs can be purchased in the Vitra pop-up stores by anyone who lives in a country with a Vitra online shop. 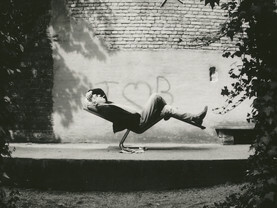 We currently have online shops in Switzerland, the Netherlands, Germany, France, Austria and Belgium. If you live in a different country, you can search for a nearby dealer here. 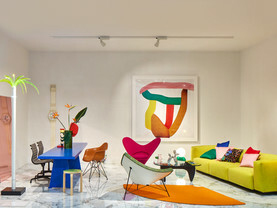 Products from the Vitra Accessories Collection are directly available in the Zurich pop-up store. Can I also pick up my chair directly from the pop-up store? We provide convenient shipping directly to your home address. However, you can also have your order delivered to the pop-up store and collect it there. What forms of payment are accepted in the pop-up store? Customers can use debit or credit cards (Maestro, Mastercard, VISA, Vpay, American Express, JCB, China Union, Diners) to pay for purchases in the pop-up stores. We regret that we cannot accept Swiss-internal PostFinance cards at the Zurich location. It is not possible to pay in cash. Are the prices in the pop-up store identical to those at a dealer? The in-store prices are the same as those in our online shop and our price list. Can I return or exchange my products in the pop-up store? 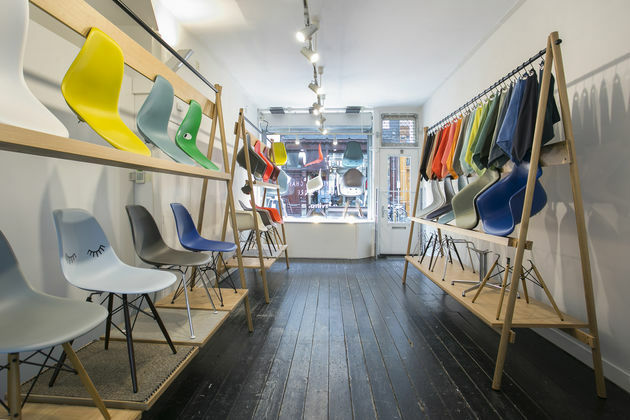 Due to the myriad possible variations of the Eames Plastic Chair, we do not keep chairs in stock, but manufacture them specifically to order in compliance with the highest quality standards. For this reason, we are unable to accept the return of individual customer orders due to mere dissatisfaction. Of course in cases where the product is defective or was damaged during transport, it can be returned free of charge using the same easy method provided by our online shop: you request a return label and use it to send the chair back. Accessories can be returned or exchanged directly in the pop-up store. More information is found in our general terms and conditions. 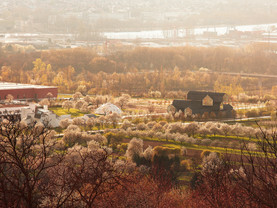 How can I contact someone at the pop-up store in Zurich? 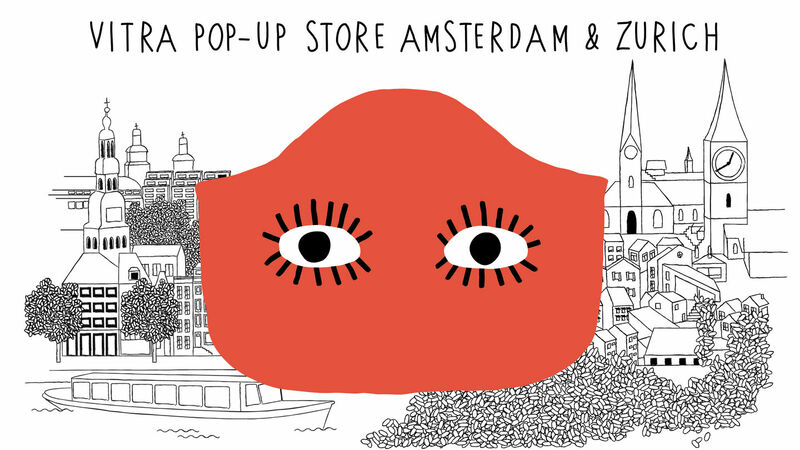 How can I contact someone at the pop-up store in Amsterdam? 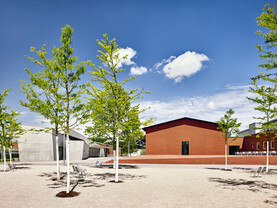 You can reach us on this telephone number +31 68 125 90 32 or via email popupamsterdam@vitra.com.